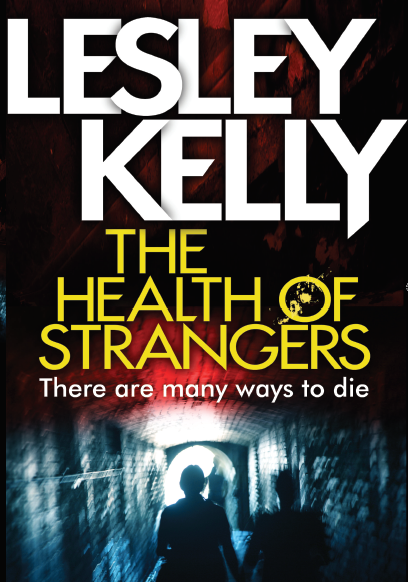 This month's author is the fabulous Lesley Kelly. Lesley was a "Crime in the Spotlight" author at last year's Bloody Scotland and I recently caught up with her at the mini-meet-up in Edinburgh. Her first novel, A Fine House in Trinity was long-listed for the McIlvanney prize and her latest novel The Health of Strangers, is out this week. I'm delighted to be able to grill her! 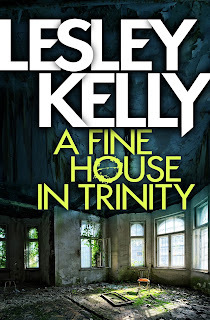 "A Fine House in Trinity" was the first novel I wrote and published. The first draft of it bore the legacy of my brief stint as a stand up comedian; it was basically a string of jokes and set-pieces linked together with the slightest of plots. I eventually got the hang of the other stuff – you know – characterisation, plotting, back story, all that kind of thing! You obviously got the hang of it all! 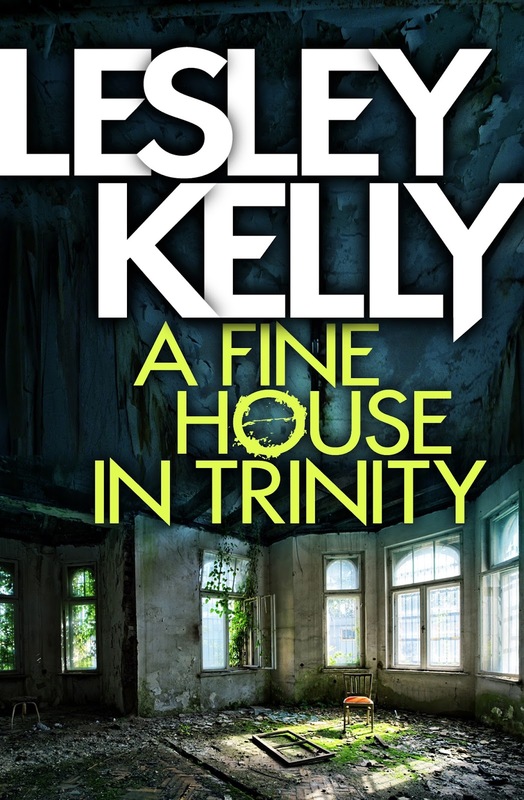 “A Fine House in Trinity” was long-listed for the McIlvanney prize. How did this make you feel? Excited? Pleased? Nervous? What benefits has it brought? It was a fantastic piece of luck! I really benefited from the exposure it brought. As a début author you are desperate for anything that makes your novel stand out, and the long-listing gave me something to brag about! Psychologically it really helps too; not only did someone like your novel enough to publish it, other people who know about that kind of thing read it and rated it. I’m a bit sad I never met William McIlvanney though; everyone says what a lovely man he was. Your new book, “The Health of Strangers” is due out this month. Tell me more about it? Nobody likes the North Edinburgh Health Enforcement Team, least of all the people who work for it. An uneasy mix of seconded Police and health service staff, Mona, Bernard and their colleagues are on the front line in the battle against the Virus, a deadly disease that’s on the rise. When two students go missing, Mona and Bernard have to tackle cults, late night raves and the mysterious involvement of overseas governments, to reach the girls before anyone else does. That sounds amazing. What prompted you to write it? I’m a big fan of the apocalyptic virus novel, but there’s always a little bit of me that thinks ‘well, actually, it wouldn’t be that bad because the government plan for it.’ In my day job in the voluntary sector I work with people in the local authority, Police Scotland and NHS who have plans and procedures in place for dealing with things like pandemics. So I thought, what if there was a virus that was lethal in some, but not all cases, and society didn’t break down? Would it lead to people changing their behaviour? Would they do bizarre and risky things to protect themselves? And what new crimes would there be? Who would try to take advantage of the situation? What are you working on at the moment? Are there already plans for the next book after “The Health of Strangers”? The second book in the Health of Strangers series is written. It’s called "Songs by Dead Girls" and there’s a little teaser for it at the end of the first book. Expect more misadventures from the not-overly-competent Health Enforcement Team. You’ve had success both with novels and with short stories. Do you have a preference? If so, which format? Short stories are so very, very, difficult. I’ve had luck with a few of them, but I can’t say it comes easy. I’ve always struggled to do the whole ‘capturing one moment that illuminates an essential truth about the world’ thing. My favourite short story is ‘Fish’ by Michael Faber – an entire parallel universe conjured up in a couple of thousand words. I was stealing three minutes of Ian Rankin and Quintin Jardine’s limelight… there was nothing about that experience that wasn’t good. I got to meet two of my home town’s legendary writers, had the biggest audience I may ever have for my work… and of course I got to know my fellow Spotlighters! Not quite at the making-a-career-out-of-this stage yet! Radio 4 closely followed by Radio 6. I’d like to know whether this is a temperate tropical island, or the Orkneys? Because when it rains on North Ronaldsay, it really rains, and my limitless supply of paper might get soggy. And I’d need more information about the diet I’d be subsisting on before I entirely ruled out number 3! So I guess I’d go for number 2, and pass my days watching cat videos. Dogs. They’re the cat’s pyjamas. City, by a country mile. Real book, until Kindle manage to fake that real book smell. Why do you need to like the protagonist?